November 14, 2018 / TheNewswire / Vancouver, Canada - Guyana Goldstrike Inc. (the "Company" or "Guyana Goldstrike") (TSXV: GYA, OTC: GYNAF, FSE:1ZT) is pleased to report that the technical team has commenced sampling and mapping of trench TTR-18-13 at the Toucan Ridge area on its Marudi Gold Project ("Marudi" or the "Property") located in the Guiana Gold Belt, Guyana, South America. Trench TTR-18-13 is located roughly 500 metres northeast of trench TTR-18-06 along Toucan Ridge and is parallel to trenches TTR-18 11 and TTR-18-12. All three trenches have been oriented to cross an outcrop of quartzite-metachert. A total of 2023 metres of trenching has been completed and 630 samples taken at the Toucan Ridge area. The area of interest continues for more than 1.75 kilometres to the east of trench TTR-18-06. To date, a total of 8 trenches have been completed within the area of interest. Trench sites are planned where quartzite-metachert is exposed or interpreted to occur beneath the transported overburden. One historical hole has been drilled near Toucan Ridge. 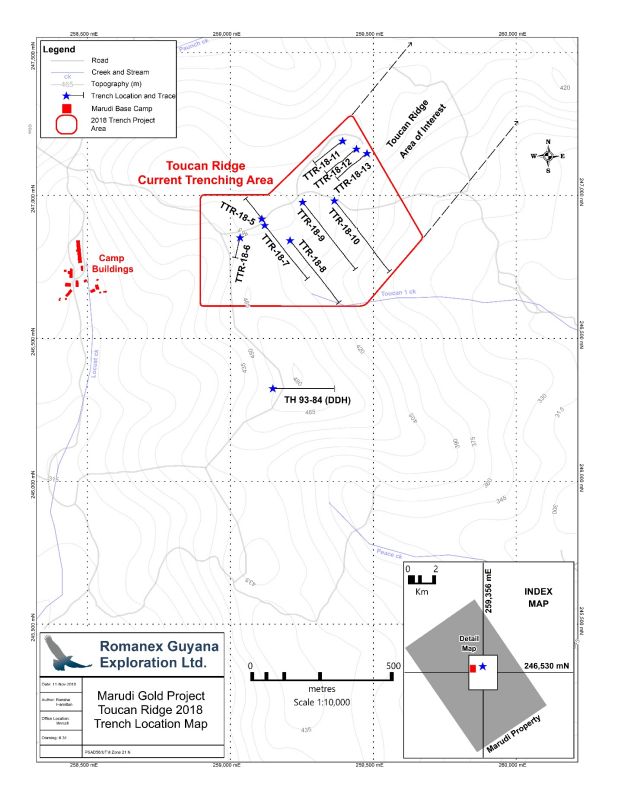 In 1993, Romanex-Sutton drilled 300.00 metres south of the ridge at the Toucan Hill area. The hole encountered a 39.00 metre section of elevated mineralization including 3.00 metres of 0.82 g/t Au at a depth of roughly 180.00 metres below surface. The hole terminated at a depth of 230.00 metres below surface in the quartzite-metachert host rock without drilling through it. The location of the hole is marked in the "Toucan Ridge Location Map" above.